Although it may not seem like it when you look at the numbers, we did pretty well with our spending over the past year. We were significantly over budget, but there's a good reason for most of the overrun, and it is unlikely to be repeated going forward. braces as well as moving expenses. As I said, we went over budget, but I will now go through each category and explain what happened and how we will change going forward. The budget for this category was set artificially low mostly due to my naivete. I didn't realize just how much insurance and registration cost for our three cars. However, we did have slightly higher expenses than normal because we had to catch up on some maintenance on the truck (which will also be the case in 2018, but hopefully not after), and we spent more on fuel than normal due to moving. Going forward, the budget for this category will be increased, but we will need to work to meet it. This is an easy one. We had to pay property tax on two houses this year, which inflated this category. The expected property tax going forward is a little higher than we originally budgeted, but we can handle it. The budget for this category was pretty arbitrary, but I have to admit we blew right by it. However, some of it went to the old house and the rest went to getting our new house up to speed. Most of the big projects we wanted to tackle are done, so we should be able to reduce spending significantly going forward. That being said, we will be slightly increasing the budget for this category going forward, because expenses always pop up when you own a home. This is a tricky one. Some of the overage is due to paying utilities on two houses for a couple months, but we still need to bring this down. Water is approximately three times more expensive at our new house, which really hurt us this year, however, we made some serious landscaping changes that should reduce our future usage significantly, so we'll see what happens. The budget for this category will be going up next year. We actually did better in this category than expected. We had to buy a lot of random things for the new house, which cost quite a bit. Now that we're settled, expenses should drop significantly. This also included some big moving expenses, which won't be repeated. This one isn't as bad as it looks. Most of this is from credit card annual fees, but we more than made up for them in rewards (see below). This is the most concerning category. We were quite a bit over budget and there aren't any good reasons. We were under budget in the Dining Out category, so we ate in more, but that doesn't explain the big overage. As far as I can tell, our shopping habits haven't really changed. It seems like some of the overage is from feeding another mouth and there also seems to be higher prices in our small town. Going forward, we are increasing the budget for groceries, but we are going to try to bring down spending as well. This one was very much expected. The overage is solely due to Chrissy and me both getting braces this year. There will be a few more payments next year, but then we're done, so this is under control. This was the big bright spot in this report. We barely used any cash this year, which means we really maxed out our credit card rewards. I think this was mostly due to not eating out at work and having to pay cash to split the bills. Update: I've had a revelation that partially explains our higher grocery bill and lower cash withdrawals--the farmer's market. In Torrance, we went to the farmer's market almost every week and paid cash for produce, which we don't really do any more. This revelation is a pretty big relief, because my financial world makes a lot more sense now. Being 40% over budget for the year definitely isn't good, but it really isn't too bad considering all the one-time expenses we had in 2017. If you look at the "Corrected" column, it looks a lot better. Our overspending is also pretty much completely offset by the income I earned working a couple extra months at the beginning of the year, so we should survive. If you're wondering what we spent our money on specifically, here's a list of everything for which we paid more than about $100. These items accounted for a little over half our spending. Based on these numbers, we earned over 6% back from credit cards in 2017. That is pretty spectacular, but I think we can do even better in 2018. The final section we will include in this post is our budget for the upcoming year. As mentioned above, we are going to tweak the budget again to make it more realistic, however, the total is only increasing ~1%, which is what I accounted for in our long-term plan. Hopefully we can stick to this budget. I'm optimistic, but you never know. 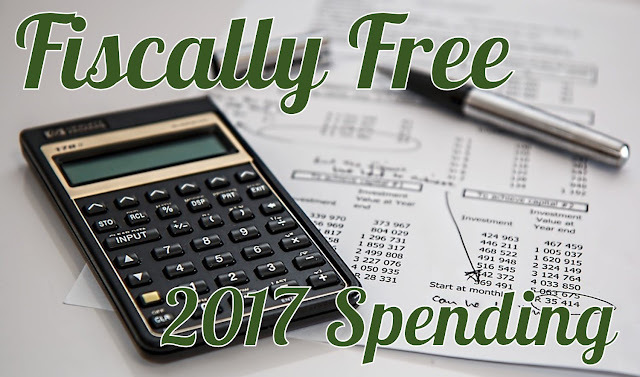 Did you stay on budget in 2017? Let us know in the comments. If you want to get your finances in order this year, we highly recommend Personal Capital. It's a FREE tool that makes financial management fast, easy and secure. Here at Fiscally Free, we use Personal Capital and we recommend you try it today. You'll be glad you did.